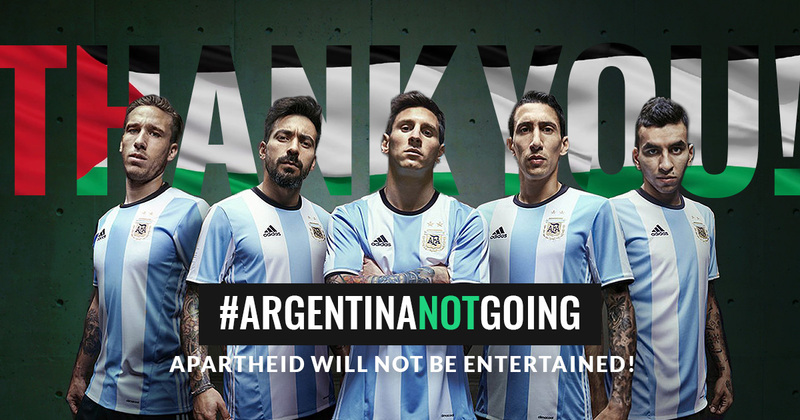 June 6, 2018 -- On Tuesday, June 5, the Argentina National Football team canceled the “friendly” match with Israel planned for Saturday, following months of BDS campaigning that kicked off in Argentina. Football fans and Palestinian human rights supporters had urged the Argentinian team and superstar footballer Lionel Messi to cancel the match, set to take place in an Israeli stadium built on the ethnically cleansed Palestinian village, al-Maliha, in response to Israel’s criminal shoot-to-kill-or-maim policy against peaceful Palestinian protesters in Gaza. Palestinian footballer Mohammad Khalil, whose career ended after he was shot by an Israeli sniper in both legs as he peacefully protested in Gaza, also urged Argentina and Messi to cancel the match with Israel. Thousands joined Khalil, signing a petition to Messi and Argentina, noting the Israeli government would use the match to cover-up its brutal attacks on Palestinians, on and off the field. Argentinian trade unions as well as the Madres de Plaza del Mayo joined the calls. Last week, a rally took place outside the Argentina Football Association (AFA) in Buenos Aires. Protests followed the Argentina team to Barcelona. On Tuesday, during the team’s training session ahead of the World Cup, Palestinian rights supporters used a megaphone to deliver the message directly to the players. Israel was reportedly paying Argentina $3 million to play the match as part of its 70th anniversary “celebrations”. We welcome the decision by the Argentina team to cancel this “friendly” match. It would have been extremely unfriendly to human rights! Playing with an apartheid state is a form of complicity, magnified by Israel's recent horrific massacre in Gaza against unarmed protesters demanding their basic freedom, dignity and UN-stipulated refugee right of return. This was all part of the Israeli apartheid regime’s sports-washing policy to use international sporting events to cover up its war crimes and egregious human rights violations against Palestinians. The fact that Argentina fans and human rights activists around the world succeeded in thwarting it gives us a lot of hope. Initially set to be held in Haifa, the Israeli government moved the match to Jerusalem, offering the organizers $760,000 in compensation. Israel’s far-right Minister of Culture and Sports, Miri Regev, is said to have conditioned the match on a photo-op with the Argentinian team, further evidence of how Israel uses sports to whitewash - or sports-wash - its image. After news of the cancellation, Israeli Prime Minister Benjamin Netanyahu immediately called Argentinian president Mauricio Macri to intervene, but Macri replied that he had no authority over the decision. The cancellation of Israel’s ‘friendly’ match with Argentina is a boost to the Red Card Israel campaign, which has called on FIFA to expel Israel - as it expelled apartheid South Africa - due to its violations against Palestinian football and its disregard for FIFA statutes. The Palestinian Football Association also called on Argentina to cancel the match. In a video message, the football team from the Palestinian town of Nabi Saleh, in the Israeli-occupied West Bank, thanked Argentina and Lionel Messi. Nabi Saleh is home to Ahed Tamimi, the Palestinian minor serving months in an Israeli prison for slapping a heavily-armed Israeli soldier standing in her front yard. “You scored a goal for freedom, justice and equality,” Ahed’s relatives said in the video. Palestinian football players are routinely attacked and denied freedom of movement to attend training and matches. Israeli forces have imprisoned, injured and killed Palestinian footballers. As Argentina striker Gonzalo "Pipa" Higuaín said, "Not going was the right thing to do." We wish Argentina all the best at the World Cup. FIFA must take note. It’s time to show Israel the Red Card.